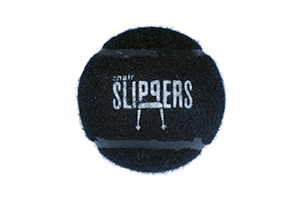 The Mini ChairSlipper is a pre-cut tennis ball that is just under 2 inches in diameter and is designed for furniture with tapered legs. Fits 1/2" to 3/4" in diameter. 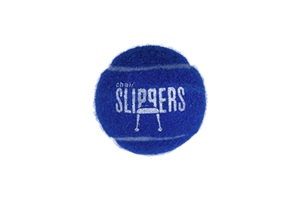 Medium ChairSlippers are pre-cut tennis balls that are slightly larger than Mini ChairSlippers and measure slightly over 2 inches in diameter. Medium sized ChairSlippers fit best on non-tapered legs. Fits 7/8" to 1 1/4" in diameter. 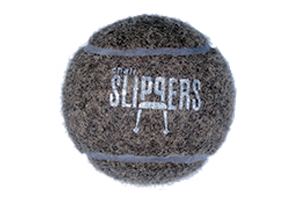 It may be the same size as a regular tennis ball but our Large ChairSlippers perform much better and they look better! Perfect for Stools. Fits 1 1/4" to 1 3/4" in diameter. "I'm very impressed with your product! Our floors cleanup quicker and the floor finish stayed all year. All we had to do was our regular burnishing. Best of all, they stay on the chairs! All of the other glides that we have tried in the past fall off after only a short period of time." "We have been using ChairSlippers since 2005. Most of our upper schools have vinyl flooring. Those classrooms have ChairSlippers on the desks. The teachers have commented that desk movements are less noisy and students can move their desks easier. The custodians like the ChairSlippers since they prevent floor scratching so that stripping of the floor wax wasn't necessary for two years now. It saves time and money considering the low cost of ChairSlippers, their durability, verses the cost of custodial labor and floor treatments. The floors look great longer."